Material: Pink Shell, 18k gold tested, blue enamel. 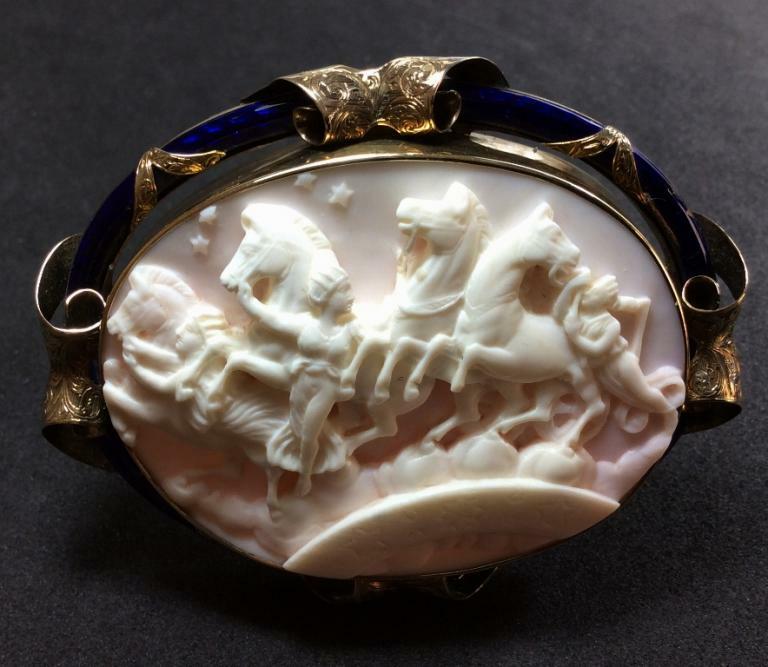 Size: 3 2/8" by 2 7/8" only cameo is 2 18/32" by 2 5/32"
Date and Origin: Circa 1860 Italy, frame could be English. 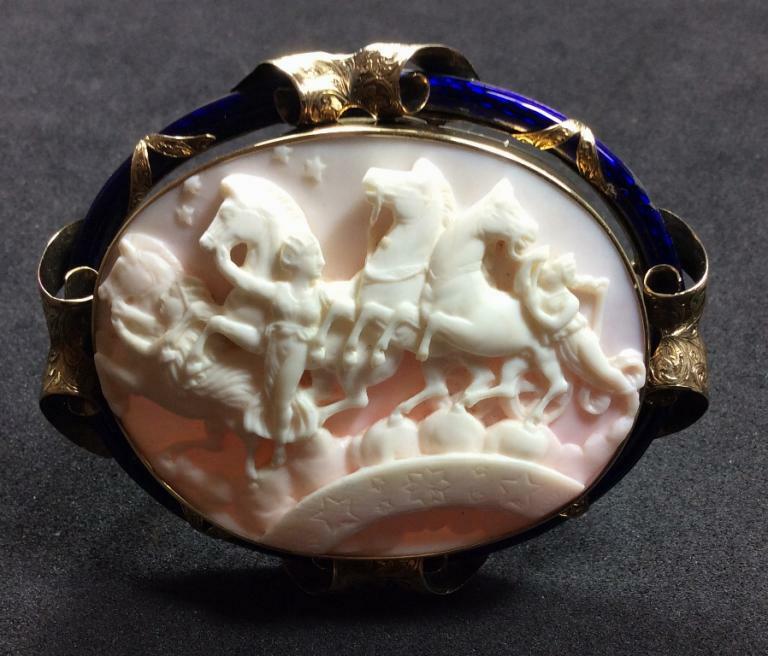 Case from Cameo Corner, London, not contemporary to the cameo. 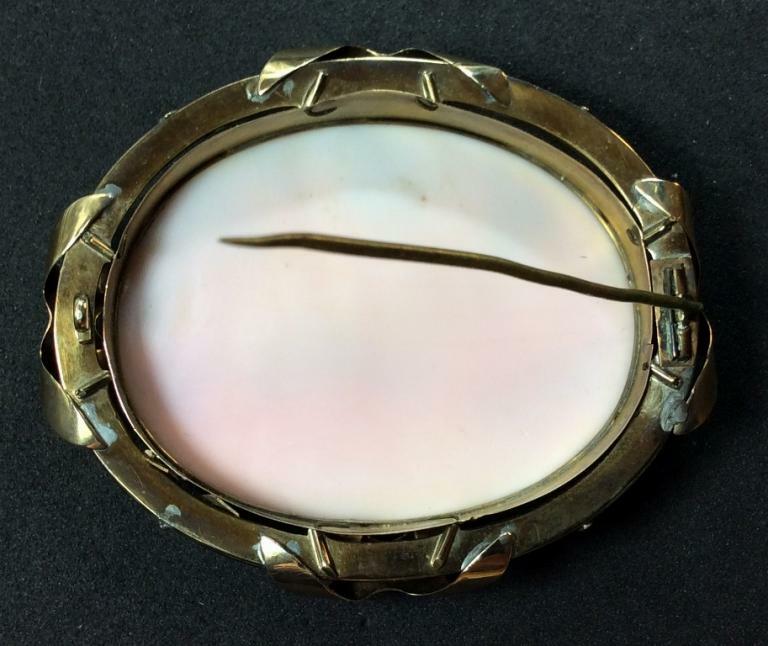 Conditions: A couple of slight natural lines in the shell only visible when cameo is backlit, not visible from the front by naked eye, the line on the top can be very slightly felt under the fingernail only close to the cameo frame on the back, it does not go through the shell. 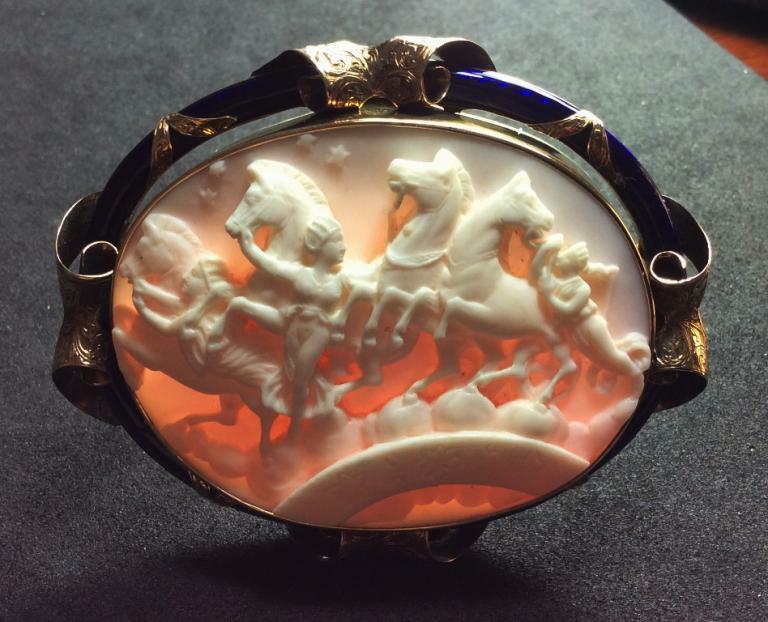 Museum Quality cameo depicting The Hours leading the Horses of the Sun after a sculpture by John Gibson made in 1850 now in the Royal Academy in London. 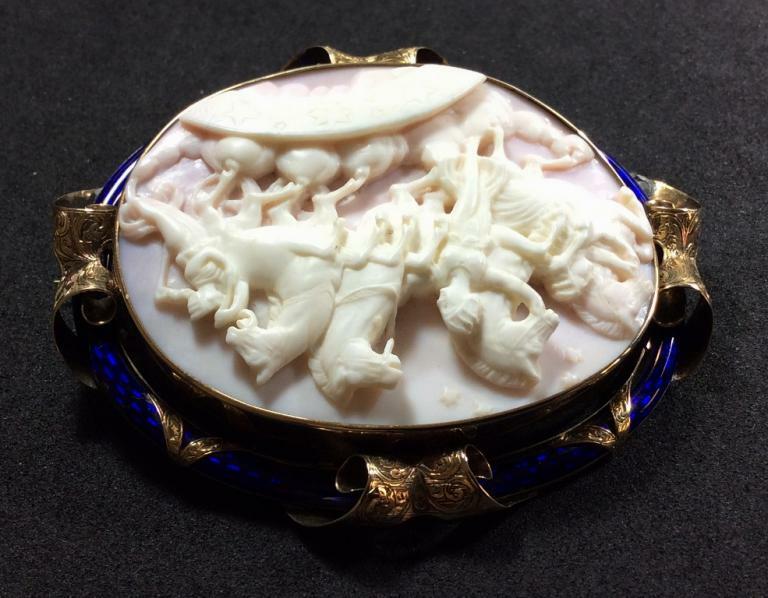 Lovely, rarest and unusual subject matter for a cameo especially carved on pink shell. 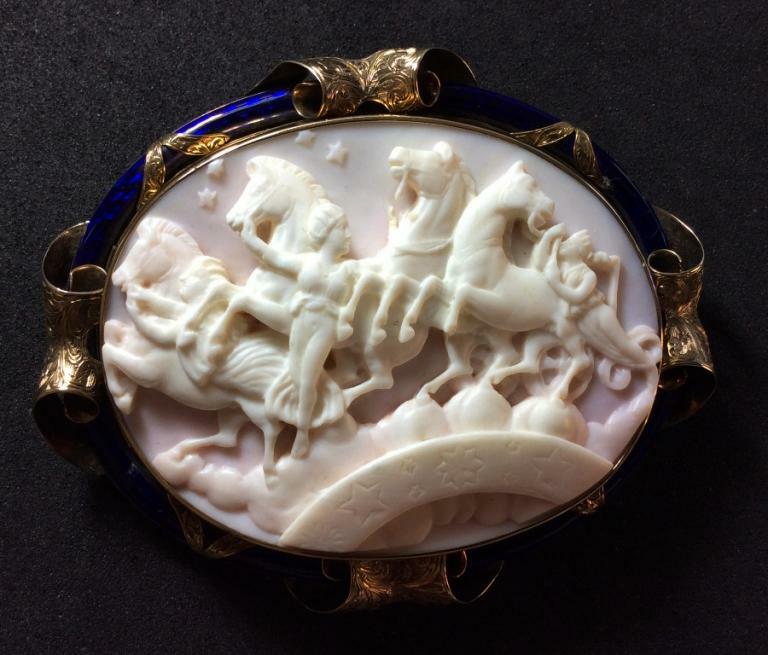 So large cameos are not easy to find, especially museum quality ones and in such fantastic condition. The carver reproduced exactly the work of Gibson, there is not details lost, even the ankle bracelets worn by the Hours were carved just like they were made on that bas relief. Surely an art work from a master carver. 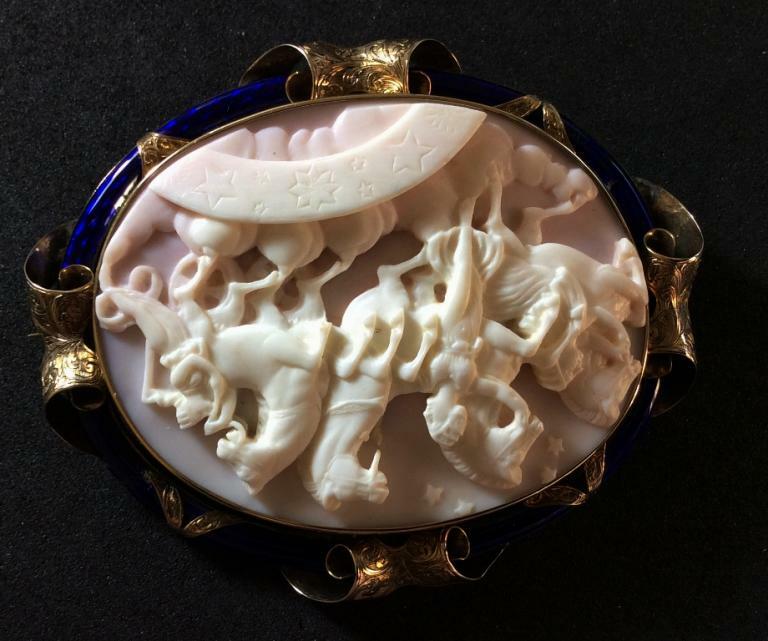 This cameo comes in a case from Cameo Corner London, which was the principal centre for the sale of jewellery in London for the first half of the twentieth century. It was located first at 1 New Oxford Street, and after the Second World War in Museum Street – always within easy reach of the British Museum. It had been founded by Mosheh Oved (alias Edward Good) who had emigrated from Poland as a watch-maker to seek his fortune in England. In this he was successful, becoming one of the busiest dealers in jewellery and attracting important and regular customers. This cameo is outstanding, the carving is more than superb, all the details are perfectly reproduced from the original artwork. Everything is just like it is in the bas-relief. Really amazing. Perfect proportions and perfect cut carving complete the beauty of this piece which is also enhanced by a stunning frame which shows four knots at the four cardinal points and is totally chiselled. A cameo which can't be missed. The HORAE, who are worshipped as Hours as well as Seasons, are the wardens of the sky and of Olympus. Their task is to open and close the Gates of Heaven, whether to open the thick cloud in the entrance, or shut it. They also yoke and unyoke the horses of the chariots of the gods, and they feed the horses with ambrosia. Some have described them as the handmaids of Helios. The HORAE were given the ordering and adornment of life. When the gods fashioned Pandora , and each of them bestowed her with a gift, the HORAE crowned her head with spring flowers. It is said that when Aphrodite was born, the HORAE welcomed her joyously, clothing her with heavenly garments. They put on her head a crown of gold, and in her pierced ears they hung ornaments of orichalc and gold. Then they adorned her with golden necklaces, and the kind of jewels which the HORAE wear themselves whenever they join the dances of the gods. THE TWELVE HORAI (or Horae) were goddesses of the hours of the day and perhaps also of the twelve months of the year. They oversaw the path of the sun-god Helios as he travelled across the sky, dividing the day into its portions. The ancient Greeks did not have hours of fixed length like we do today. Instead they divided the hours of daylight into twelve portions, identified by the position of the sun in the sky. Thus the length of the hour varied between the longer days of summer and shorter ones of winter. The twelve Horai were not always clearly distinguishable from the Horai of the seasons, who were also described as overseeing the path of the sun. Anatole or Antolia is the dawn , a maid of Harmonia attending the East Wind's gate of her palace. Mesembria is Noon. She is a handmaid of Harmonia, Nurse of the World. She attends the South Wind's gate of Harmonia's dwelling. Dysis is Setting. She is a handmaid of Harmonia, Nurse of the World. She attends the West Wind's gate of her dwelling. Nurse of Selene (Moon). Hesperis (Evening) is by Atlas the mother of the HESPERIDES. She is also said to be the daughter of Hesperus , the son of the TITANS Iapetus & Clymene.